Yoga is a practice that’s been used for thousands of years to soothe the mind and challenge the body. The benefits of yoga have gained significant popularity in recent years, but it is more than a fad. In fact, yoga is beginning to expand beyond typical class spaces like a studio or a gym. In fact, CEOs are introducing workplace yoga to offer employees physical benefits and boost workplace morale. Today, we’re discussing a few reasons why this health-focused initiative is a great idea. Many people who work a desk job develop severe back pain, which can lead to taking sick days at the company’s expense. In the past, such discomfort has caused an entire country 40% of 7.6 million missed working days. The pain develops over long periods of sitting in one position, but it has multiple repercussions when employees have to take days away from the office. Why not be proactive and address this issue by soothing their pain in-house? Workplace yoga addresses pain before it becomes chronic, and soothes the mind as well. It can be one of the most effective hours an employee spends at the office. The time to step away from their desk gives people an opportunity to log into the things going on in the body. Although yoga is commonly known as a form of exercise, the mental benefits are just as clear as the muscle definition. When employees become more mindful, the whole company benefits. 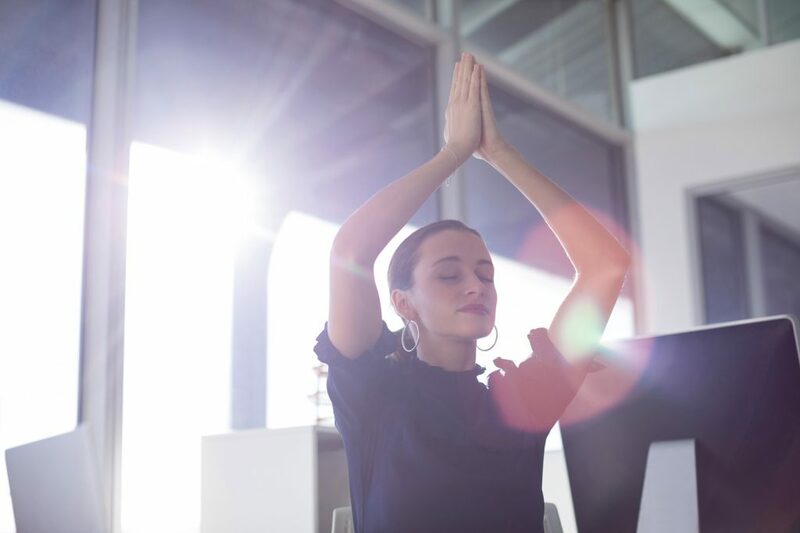 By integrating workplace yoga, it’s common for companies to see a rise in productivity rates, as well as more creative, innovative ideas, come through the funnel. This is because employees now have a space to let peripheral things go and focus on their tasks at hand. They have an improved sense of clarity as they return to responsibilities, and overall morale improves too. Yoga is a form of meditation. It brings people in tune with their breathing, opens their perspective to challenges and opportunities in life, and calms the ego. Such mental breakthroughs can shift the energy in the office from tense and stressed to be more collaborative, understanding, and welcoming. It transforms the way departments interact and employees handle frustrations with one another. Yoga actively combats the physical effects of stress at work, too. This includes obesity and eating disorders, as well as heart disease – all better kept at bay with an employee yoga program. Plus, yoga reduces the amount of time employees have to take off. It can save companies thousands on sick days or personal time many feel pushed to take when their pain or mental health pushes the limits. Give your people the chance to roll out their mat at work and see how the benefits roll in. Workplace yoga may be the missing piece in someone’s routine, no matter if they are a department manager or entry-level intern. It is the chance to relieve the body and the mind, and that’s something we can all use. Are you ready to feel the difference yoga can make for yourself? Contact us today. There’s just something relaxing about yoga. The breathing, the stretching, the feeling of tranquility. And did you know that yoga can even help with addiction recovery and wellness? The strong spiritual link between the body and the mind is one that we often neglect, especially through addiction. But it’s time to take your body back. Read on to see how yoga lessons can be one of the best resources for recovery. It almost sounds silly to say that yoga teaches you to breathe, but it’s true. Our lives have become so busy that we often neglect to realize how quick and shallow our breaths are. When was the last time you stopped to check in with yourself? Yoga is all about just that — connecting back to yourself and the world around you. The world can be a busy and hectic place, resulting in a lot of harmful stress. It’s important to slow down every now and again and breathe. Yoga is a great way to physically and philosophically slow things down. During your practice, you’ll learn how to focus on your breath and slow your heart rate. While this will no doubt be difficult at first, soon you’ll realize that you’re the master of your mind. You’ll face temptation throughout your recovery period. But yoga can help you build up the discipline and self-confidence to ignore those urges and recognize them for what they are. Speaking of recognition, there’s no doubt that addiction isn’t only a physical matter. There’s a tremendous amount of mental effort that needs to go into recovery, as well. Often, those who in recovery will feel a rush and flood of emotions that can feel overwhelming. They may feel things they intentionally haven’t felt in years. Yoga is a fantastic resource for emotional recognition, as it’s all about focus and awareness. Over the last few years, there has been tremendous research into how yoga can help with mental health. One study put out by Harvard Health suggests that yoga is a great way to help those with depression and anxiety. The study tested a group of women who considered themselves as distressed in one way or another. A few months later, the group reported fewer feelings of sadness, stress, and worry. All it took was 2 yoga classes per week. Think of your yoga lessons as an investment in a better you. As previously mentioned, addiction recovery is both a physical and mental process. And there’s no doubt that during recovery, having some extra strength can be helpful. During recovery, it’s common to feel a variety of symptoms. You may find yourself sweating uncontrollably, for instance, or even shaking. These symptoms can be debilitating and even physically painful. One of the most common symptoms are frequent, persistent aches and pains. Yoga is all about stretching and flexibility. By practicing a few times a week, you’ll increase blood flow and minimize these symptoms. At the end of your recovery, you’ll be stronger than ever. At FTX Wellness, we’re all about practical, healthy recovery. Whether you’re brand new to recovery or maintaining your sobriety, we’d love to be a part of your journey. Get in touch today to see how our fitness plans can transform the way you view the recovery process.